- FREE trial license for Act On File and its installation files. FREE license for Audio Control v. 4, to use on any computer where Photo Window is installed and activated. [? ]Download and install Audio Control, 4 on the same computer where Photo Window is installed and activated. Audio Control, 4 will self activate and be ready for use. - includes a FREE license for use (commercial and home) of Audio Control. FREE License with Qualifying Software [Key Facts] - requires installed and activated FREE License Qualifying software. activation info - any version The software must be installed and activated on the same computer. An Internet connection is required for software activation. All licenses include FREE updates for the lifetime of the license. All licenses include unconditional 100% Money Back Guarantee for 30 days after the purchase. Shipping costs are not refunded. All licenses include FREE Help and Support. For license permitting number of simultaneously activated users not mentioned above or other inquiries please email or contact us. Commercial customers such as galleries, requiring custom build of Photo Window please email or contact us. Trial License - A 30-day free trial license. 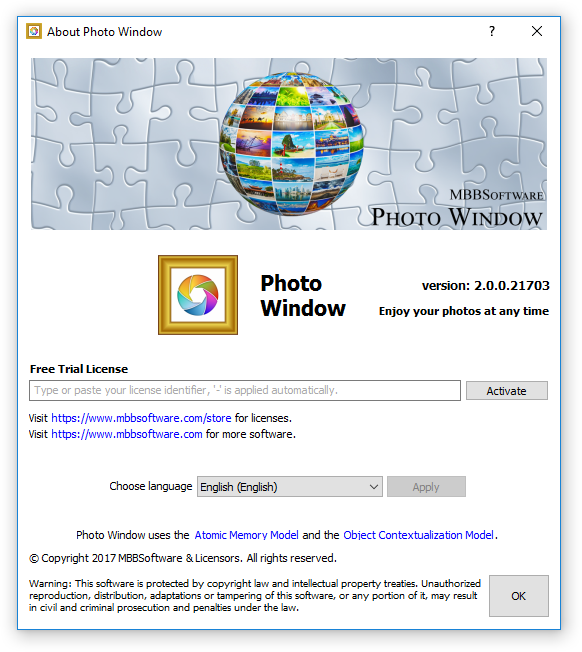 Free License - Photo Window can be used for FREE on a computer with installed and activated Free License Qualifying Software (Act On File). Standard License - Requires activation and deactivation of the software. This license type allows activation of Photo Window on several computers simultaneously. A standard license for Photo Window can be purchased at the e-store with a software download or a thematic DVD set. Licenses purchased with software download can be used to simultaneously activate the software on a specific number of computers as purchased. Licenses obtained with thematic DVD sets can be used to simultaneously activate the software on two computers. The Photo Window thematic DVD sets are beautifully crafted items containing a software license, an installation DVD disc, a blank DVD disc for storing photos and videos, a greeting card, a DVD writing pen, a self-adhesive resealing sleeve, recommendations and instructions, all in a beautiful box. Note that Photo Window is a Free License Qualifying Software for Audio Control - our acclaimed audio volume control utility, which can be used for FREE on computers with installed and activated Photo Window. Copy/paste or type your license identifier, which is a 32-character string of letters and numbers that represents (identifies) your license (e.g., 1V-2I72Y-1N6L6-R1W3U-3S1UW-58296-X6ORE), into the "License ID" text box of the "About" window of the software, and then click the "Activate" button. Photo Window will display a confirmation that the software has been activated or an error message in case of an error. Deactivate Photo Window from a computer by clicking the "Deactivate" button, which is present only when the software is activated on that computer. An Internet connection is required for software activation and deactivation. The number of computers on which Photo Window can be simultaneously activated using a specific license can be seen at any time in the license owner's My Licenses area on the MBBSoftware website, provided that the license is associated with their account. Here, the license owner can also see the computers on which the software is currently activated, deactivate the software from any computer, and reissue the license identifier as needed. Standard licenses purchased with thematic DVD set or obtained outside the MBBSoftware website are not associated with a user account at their issuance. To protect your license from being locked, lost, or stolen, consider creating a free account at http://www.mbbsoftware.com (if you do not already have one) and associating your license with it. Use the "Claim License Ownership" controls at your My Licenses area and your license identifier to associate the license with your account. This will allow you to perform software deactivation from your account - for example, to deactivate the license from a broken down computer, as well as reissue the license - for example, it the license identifier becomes known to a third party who uses it without your consent. Note that an unassociated license can be associated with an account only once.